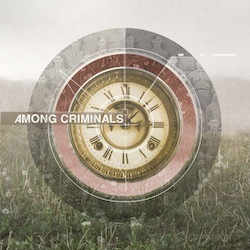 Among Criminals, a native alternative and punk band from Philadelphia recently released their new self-titled album, Among Criminals. The album has some killer tunes in it and is a ride from start to finish! It starts with Skin & Bones, a steady drum intro begins the song followed by a groovin' bass line, awesome guitar work and vocals that fit in perfectly with the other instruments. I heard this song when the band played in Philly and I must say, when played live, it really makes you want to just get up and dance. As the song dies down we are greeted with an excellent guitar solo that left me more than satisfied. Next we have War, the first couple lyrics in the song let you know that this will definitely be a song aimed at those who think war is good. "War never settles the score", begins the song and continues to present itself throughout the rest of it. War ends with a slowed down tempo and slowly but surely fades out, leaving you to think about the politically strong lyrics that were involved. Following War is Smartest Man In The World. A sped up beat makes this track similar to the first, making you want to dance non stop. Georgia Skies is the following track, again slowing down the tempo, and to me, having a "grundge" type of sound to it. Near the end what sounds like a guitar solo kicks in. I really thought this made the song, it sounded like random strumming but was in the right song and it started at the right time. After Georgia Skies we have Thin Lines and Time Bomb, two songs that, I think, compliment each each other. Thin Lines is a more heavy, raw and fast paced song, while Time Bomb is slower and throws a tad bit of reggae into the mix, giving the album a slight mellow vibe. Bare-Handed Hitman was another song I was familiar with. During the show in Philly Among Criminals played this and again it was one of those songs that made the entire audience dance. For a group to play an unreleased song and have the whole audience dance is incredible to me! Mad props to Among Criminals! As the album winds down Chapter; Nothing, Verse; Nothing suddenly kicks in with a sick sounding guitar followed by chilling vocals. This far paced track ends the album on a good note. At one part of the song everything stops and all you hear is clapping and humming until the vocals kick in again, but the interesting part is that the percussion is done with only clapping, it really stood out to me as something different and unique in the album. So all in all Among Criminals have produced an album that is awesome, fast and heavy at times, as well as lighter, slower and mellow at times. Each song compliments the others and has something unique. If you haven't already go pick up Among Criminals, and if you can get to one of there shows, do it! Its an unforgettable event!